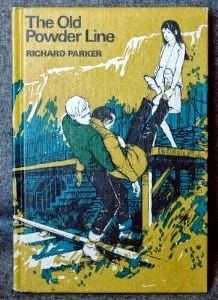 The Old Powder Line, by Richard Parker (Thomas Nelson, 1971) is very enjoyable English time travel story. It tells how an ordinary kid, fifteen year old Brian, discovers that there is a fourth platform at his local train station that he had never known about (even though he's been a keen train spotter for years), and from there, a steam train travels on an abandoned railway to the old powder mill (as in the ingredients for gunpowder) up in the hills. Though he knows it's impossible, he boards the train, and when he gets off at the next stop he finds he's gone back in time 14 years...but fortunately, he gets on the train going in the other direction, and is in the present again. What makes it such a good read is not just the very admirable time travel mystery, which is a pleasing one, but the friendship that develops between Wendy and Brian. He'd never seen her as a person before, but gradually he does, and there is a nice hint of possible romance in the air. Mr. Mincing's travel back to his past as a healthy, care-free child are also poignant and thought-provoking, though I do want to make it clear that he is never portrayed as a helpless object of pity. And what's also nice is that not only is a grown-up an active participant in the adventure, there are other grown-ups who take Brian's story seriously, and believe him enough to actually be of use (as a grown-up myself, I think I appreciate this more than I might have back in the day). Apparently Richard Parker wrote many books, though it's hard to find out much about them...I shall be on the lookout for them, because I did enjoy this one very much. Like so many of these, it looks so familiar... maybe it will show up in a cupboard somewhere at school! This book sounds great, Charlotte. I'll look for it. I doubt my library will have it though. Glad Amazon does. I'm enjoying this one - thank you! I'm glad--thanks for letting me know!